Sean McGuire runs the ball on Hanson Field. MACOMB Ill. — The snow wasn’t the only thing falling on the cold Saturday Nov. 17th afternoon. After a heartbreaking loss to the Sycamores of Indiana State on a last second field goal by Sycamore kicker Jerry Nunez, tears were falling all over the Leathernecks sideline. The Leatherneck season was one that all the 21 seniors on the team wanted to end differently. A hard-fought battle by the Leathernecks ended with 3 and a half minute 71-yard drive which culminated in the game winning field goal. After shaking hands with the Indiana State players, seniors like quarterback Sean McGuire and long snapper Hunter Varga somberly jogged to the sideline into the arms of their parents. It was a very emotional ending to an emotional season. 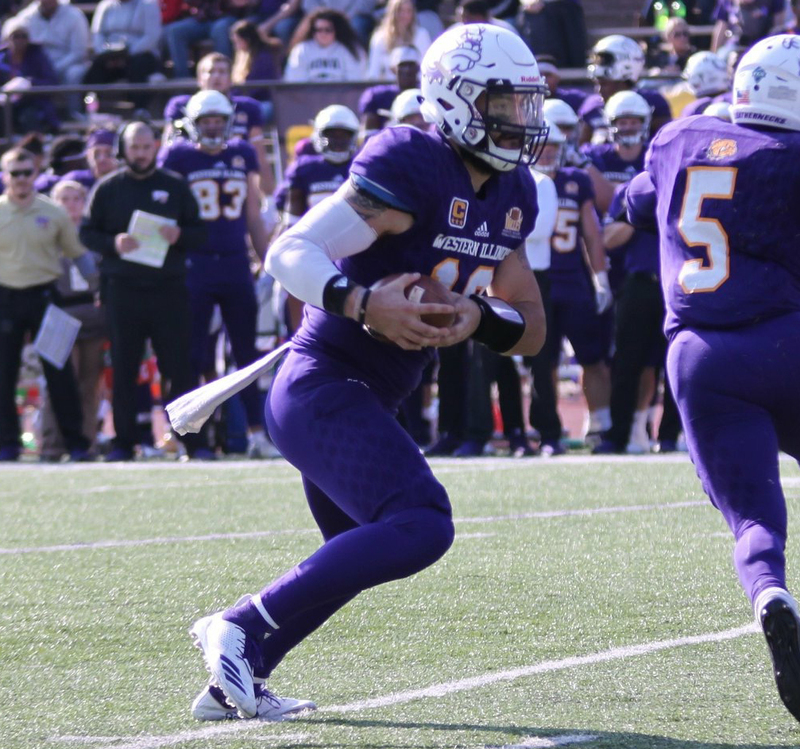 The Leathernecks returned 21 seniors to the team this year, each of them hoping to have more success than their previous season which ended with a loss in the first round of the FCS playoffs. The season started off with a struggle with an 0-2 start after a 26-23 loss at Montana State and a 34-14 loss to the Big Ten’s University of Illinois. McGuire looked solid throughout the first two games tossing four touchdowns and 440 yards. 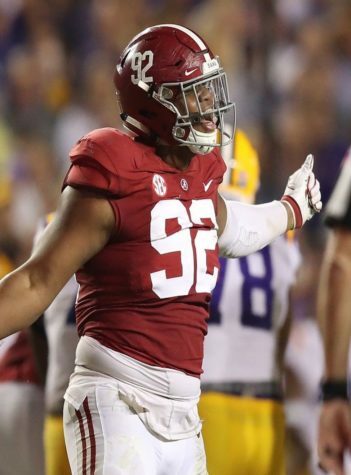 Linebacker Quentin Moon led the defense with 21 total tackles during the first two contests while also recording half a sack against the U of I. 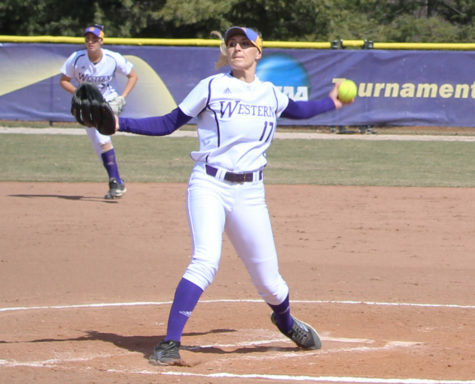 The Leathernecks then traveled home to Hanson Field where they defeated the No. 15 Grizzlies of the University of Montana 31-27. Newcomer John Brunner had a day as he pulled in 7 catches for 180 yards and touchdowns. The next two games, against No. 14 Illinois State and No. 1 North Dakota State, weren’t what the Leathernecks wanted as they lost both of them, bringing their season record to 2-4; a record that would make it very difficult to make the FCS playoff again. Knowing what situation they were in, the Leathernecks knew that the final stretch would be full of must-win games. A 31-14 routing of Missouri State saw Western travel back to Macomb to face off against a strong Northern Iowa team that was ranked number 17 in the nation. Behind a strong offense which saw McGuire pass for 300 yards and two TDs and the dual running back threat of McShane and Max Norris, who combined for 45 yards and three touchdowns, the Leathernecks put up a strong 37 points. The defense, behind two Pete Swenson sacks and a defense total 8 tackles for loss, held Northern Iowa to just 17 points in a win that created some positive momentum for the Purple and Gold. The Leathernecks traveled to Southern Illinois where a last second field goal brought Western up 34-31 and a 5-4 record on the season. 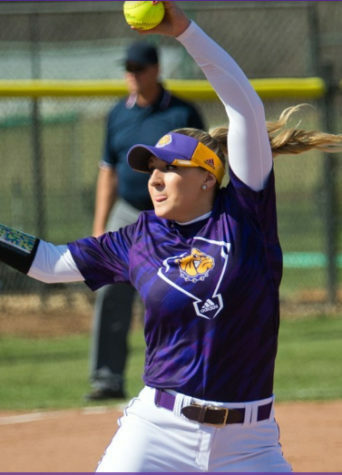 The next week in South Dakota saw the three-game win streak end as the Purple and Gold fell to the Coyotes 17-12, a loss that brought the Leathernecks their fifth loss and their path to the playoffs almost obsolete. Traveling back to Macomb for senior day, Western knew they had to beat No. 24 Indiana state if they wanted any shot at the playoffs. Steve McShane led the offense with 132 rushing yards and one touchdown while Swenson and Moon combined for one and a half sacks and 20 total tackles. The seniors gave it all this season. They fought until the final seconds ran off the clock and they couldn’t give any more. The season may not have ended the way the team wanted, but each senior gave all they could for this team over the past four years. Finishing the season at 5-6, the Leathernecks did not make the playoffs.